We had a magical morning watching whales on Wednesday. The ocean was calm, the winds were light, and we could see for miles. Guests on our Wake up with the Whales Cruise saw spouts from somewhere around 20 different Humpbacks, and lots of breaches in different directions. We couldn’t believe our luck when seemingly out of nowhere, two whales breached at the same time about 100 yards from us. But that wasn’t all — they continued breaching at the same time (or close to it) 6 more times before they accomplished whatever it was they were trying to communicate and stopped their surface activity. We also got to see some pec slapping and tail lobs from other whales in the vicinity. After returning guests from this cruise, we went right back out again on our Snorkel and Whale Watch Adventure Cruise. This time, we encountered Momma Humpback with her calf. Baby was on the surface a lot, and Mom was doing a good job keeping track of him…surfacing occasionally, or hanging around right below him. Ocean Sports Whale Fact of the Day: Just how difficult is it for a 40 ton, 45 foot long animal to “fly” from the sea in a total breach? 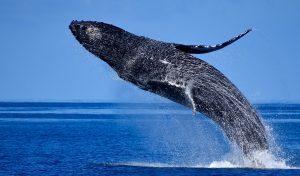 Observers have reported seeing Humpbacks breach after only two kick strokes for propulsion. Based on the formula for calculating horsepower, measurements of laminar flow around cetacean skin (how water flows past the skin of the animal), girth and drag in the water, the breaching whale is producing between 1500 and 1700 horsepower in order to “catch air”. We used to think it was closer to 5000 horsepower, but with the aid of a calculator and more accurate measurements, we’ve been able to recalculate …still, try this yourself next time you’re in the water. We’re betting you won’t get very far!